Based in Perth, Western Australia, I enjoy writing about and photographing events and places of interest whenever I get the chance. The Cockburn Cement Plant at Munster was established in the early 1950s, close to nearby Woodman Point, where the raw materials for production could be obtained from the ocean floor. The area surrounding the plant was sparsely populated to start with, but over time the structure has become increasingly visible to growing numbers of people who live and work in ever closer proximity. 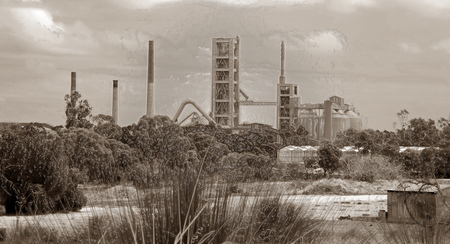 This image was shot from Russell Road and shows the plant – which rates amongst Australia's highest producers of cement and lime - nestled into surrounding farmland.